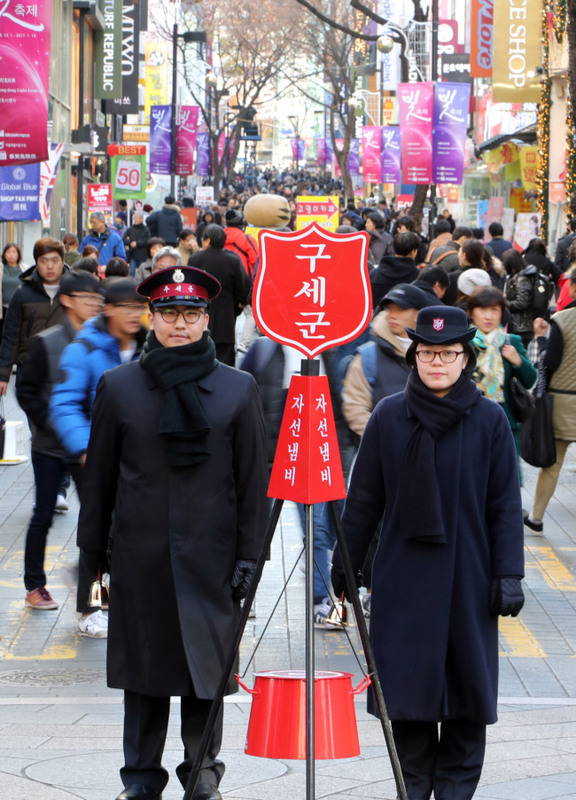 A regular sight during the Korean holiday season: Salvation Army volunteers stand next to their signature red kettles and ring handbells to raise donations. 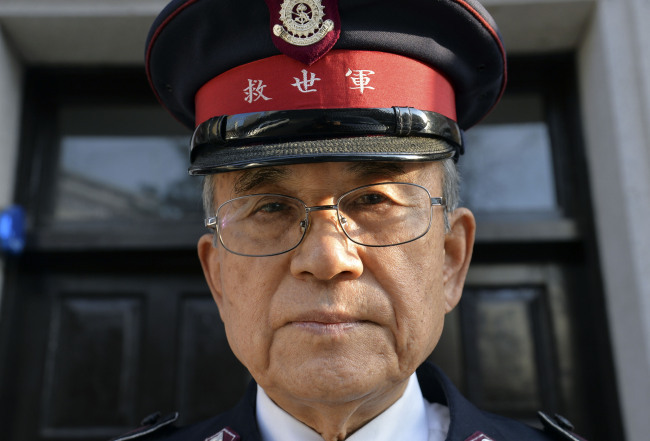 One such volunteer, Lee Sung-deok, 83, who has taken to the streets every winter starting 1954, rang his last bell this year, retiring after decades of charity work. Over 62 years, Lee witnessed the ups and downs of Korean history in the flurry of the streets, he told The Korea Herald in an interview at the Salvation Army’s Korean headquarters in Jeong-dong, Seoul, on Dec. 20. The early years of his service came after the Korean War, when the debris of destruction was only beginning to settle. Abject poverty was the norm; hundreds of homeless families lined the streets in the middle of winter, recalled Lee. Then, the principal job of the Salvation Army was to use the donations to purchase essential items -- food, clothing, blankets -- and distribute them to homeless around the country. Some would even dig holes in the ground on the Han riverside to escape the cold during winters, Lee said. “It’s hard to imagine now, but people were actually living in trenches. Over six decades of service could have tired even the most devoted of servants, but Lee beamed with pride as he spoke of his experiences with the Salvation Army. The international church and charitable organization adopted its name 151 years ago when it was established in London. The military-like name and structure, Lee explained, represented the philosophy of the group: Aiding others was the primary purpose of the group, and the efficient achievement of that goal had to be the duty of all of its constituents. Even in modern, economically thriving Korea, Lee says, the Salvation Army still has a lot to do. Nowadays, more systemic than ever, the Korean operations carry out numerous charitable projects in areas ranging from education, health and elderly care to the environment. Meanwhile, the method of collecting donations has changed: With people carrying around less cash, it is possible to give donations via credit card at some kettles, Lee said. 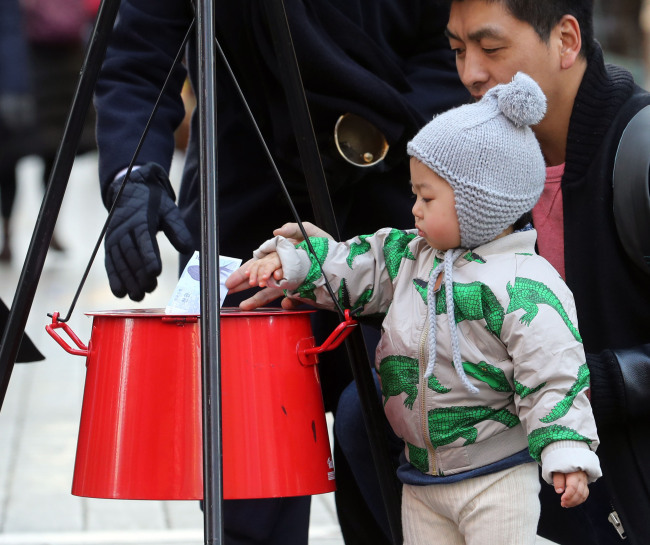 Last year, the red kettles amassed a record total of 10.6 billion won ($8.8 million). 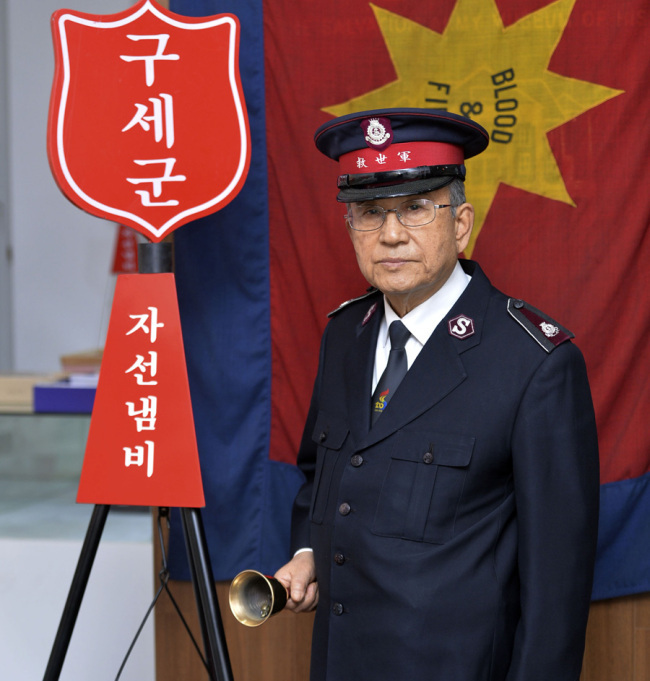 This year, the Salvation Army upped its goal to 13 billion won. On Wednesday, an anonymous donation was found in the red kettle next to the Myeongdong Cathedral, along with a letter that read: “I’m sorry to say this is all the money I have made through collecting cardboard boxes, old clothes and cans. I hope it can be of help to those more are in difficult situation than myself.” The enclosed amount was 1.6 million won. This year, what worried Salvation Army volunteers was not the pockets of donors, but the ongoing rallies at Gwanghwamun Plaza, with the Koreans gathering every weekend to protest against President Park Geun-hye, currently undergoing an impeachment trial. “For safety reasons, we can’t have people asking for donations in a crowd that is packed full with people,” Lee said. Some protesters even took advantage of the Salvation Army volunteers’ visibility by posting stickers that read “Out with President Park” on their backs when they weren’t looking. Still, Lee remains largely optimistic about the conscience of the Korean society as a whole. “There have been too many memorable donors during my time in the streets for me to pick just one,” he said when asked to recall a scene that has particularly stuck with him over the years. “But it always brings mixed emotions when we see people who are dressed poorly, or look like they’re in much need, come to the kettle and slip in money. And there are very many who do so, many more than you would expect,” he said. Even after his retirement next month, Lee said he will continue to work with the church. But after a lifetime of braving the cold, he will find ways to do so from behind a desk, Lee remarked with a chuckle.